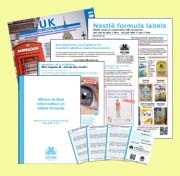 Nestlé is sponsoring seminars on "Public Private Parntnership in Nutrition" and "The role of beverages in childhood nutrition". Around the world Nestlé is pushing governments to be a "partner" in its initiatives - such as its efforts to promote desserts as part of Mexico's hunger strategy (let them eat cake?). 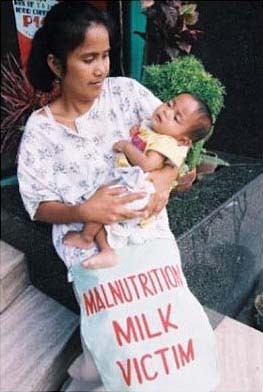 At the same time, it is pushing for regulations introduced by the Philippines to counter irresponsible baby food marketing (left) to be replaced by its own law. 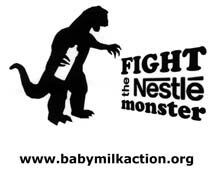 The Department of Health, UNICEF and WHO in the Philippines have stated the law Nestlé is pushing, "aims to support multinational companies while damaging the Filipino society: families, the mothers and children". Danone - the second biggest baby milk company, famous for its yoghurts - is sponsoring a seminar on "Yoghurt in nutrition". Coca Cola continues its strategy of diverting attention from its sugary drinks by pointing to sedantry lifestyles as the cause of obesity, with a seminar on: "Active healthy living and the prevention of chronic disease". General Mills, the company that partners with Nestlé as Cereal Partners to produce high sugar, high salt foods, is sponsoring a seminar on "Food choices throughout the day to combat global obesity". "Tactics also include gifts, grants, and contributions to worthy causes that cast these industries as respectable corporate citizens in the eyes of politicians and the public. They include arguments that place the responsibility for harm to health on individuals, and portray government actions as interference in personal liberties and free choice." Anyone in Spain wishing to demonstrate outside the event please contact Baby Milk Action. The event is being held at the Granada Congress Centre - click here for location and programme. Make a donation so we can continue our work holding corporations to account - click here. Send a link to the statement from the Conflicts of Interest Coalition to your political representatives and call for independence in policy making - click here.